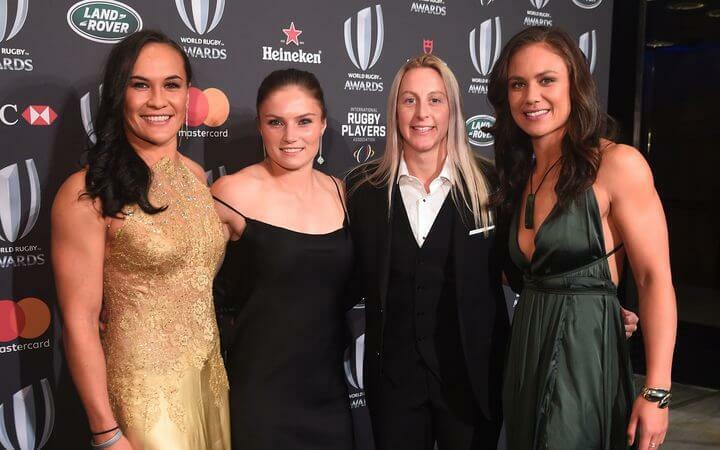 New Zealand women dominated the World Rugby Awards ceremony today, taking out the Team of the Year (Black Ferns), the Women’s Player of the Year (Portia Woodman) and the Women’s Sevens Player of the Year (Michaela Blyde). Woodman reflected a strong vein of Kiwi modesty in her acceptance of the award, underplaying her marvellous contributions to both the Seven’s Olympic silver medal and the Black Ferns world-dominating fifth Rugby World Cup. Yet she, Blyde, and the Black Ferns and Sevens teams have done far more than this. They have taken New Zealand women’s rugby to a whole new level and been a major part of the rise and rise of women’s rugby worldwide. Contracting the Sevens players provided a big boost, giving women a viable professional pathway and more time to commit to developing their skills. Many of the New Zealand women who won Rugby Sevens silver at the 2016 Olympics have become household names. OIympic visibility spilled over this year into the most successful Women’s Rugby World Cup ever, which attracted the highest ever attendance, TV and online ratings, and social media engagement, including close to 50 million video views. There is no doubt that women’s rugby has proven its audience pulling power. Internationally, World Rugby just announced 17 female positions on its council as part of its strategy to grow women’s rugby and introduce gender balance in leadership. The first-ever women’s Barbarians match took place, featuring New Zealand’s Emma Jensen. World Rugby has also appointed former New Zealand Olympian Katie Sadleir as general manager of women’s rugby and launched a long-term women’s rugby plan. In New Zealand, former Black Fern captain Farah Palmer became the first woman elected to the New Zealand Rugby Board and several other unions appointed women to their boards. Palmer is hopeful but cautious about the spate of recent activity and interest. “I feel like momentum has been gathering,” she says. “I think we have some really strong advocates for women in the game in key positions”. She credits New Zealand Rugby, Sky TV, the players’ union and players for working together to create interest and ensure a high-quality and sustainable pipeline of players. Many people told Palmer that the 2017 New Zealand versus England World Cup final was one of the best rugby games they had ever seen. At the same time challenges remain. In his first week in office, new Minister for Sport Grant Robertson asked to meet with New Zealand Rugby to discuss pay equity for the Black Ferns. And Palmer knows that support for women’s involvement has to be built into the system at all levels. Pointing to her own widely publicised election as the first female on the New Zealand Rugby Board, she explains that she was elected as the Māori representative and currently there is no requirement for a female representative in New Zealand Rugby’s constitution.